Although former middleweight top contender Vitor Belfort was forced to withdraw from his UFC 139 shootout with Cung Le due to injury, the Brazilian already has his sights set on his next opponent. Apparently, Chael Sonnen (Pictured) has his radar locked on Belfort, as well. “I hope I can fight him. Let’s get this trash talker,” Belfort told Tatame. “I think it’s the perfect timing, he’s a good opponent and it’s a fight that everybody wants to see. Even if Anderson [Silva] wants that fight, I believe [Anderson] would give me this fight as a gift. I really want to fight him. If he wants to fight Anderson, I’d be a great test for him. 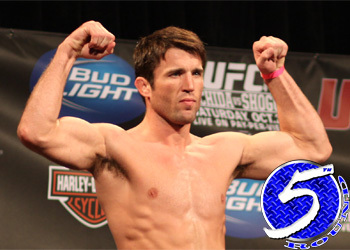 While Sonnen’s dance card is filled courtesy of a UFC 136 tango against Brian Stann, the controversial wrestler appears more than willing to oblige. “The Phenom” most recently put Yoshihiro Akiyama to sleep in the 1stRound at UFC 133 in August. Belfort hopes to resume his career in December. Sonnen, on the other hand, hasn’t been seen since tapping out to middleweight king Anderson Silva at UFC 117. Since the August 2010 submission loss, he has been busy badmouthing nearly every Brazilian fighter within earshot.